City Contact Cleaners specialise in commercial window cleaning. Over the course of more than 80 years in business, we’ve worked for an array of different corporate businesses and across the public sector. 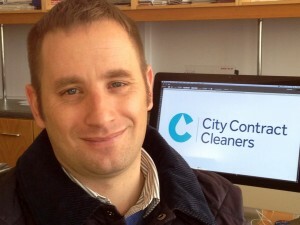 City Contract Cleaners was founded in 1928 by William McCartney, the great, great grandfather of current director Martin McCartney, as a small domestic window cleaning business. We’ve come a long way from those days of buckets and ladders – though we’re still happy to take the traditional route when it’s the best option. Now, we draw upon almost 90 years of experience to provide a dependable commercial window cleaning service for our customers across the north and south of Ireland. From our headquarters in Derry, Northern Ireland, we travel throughout the island to clean the windows of buildings ranging from small local shops to huge industrial sites. Whatever the size of job, we pride ourselves on providing you with a polite, cost-effective and safe service – leaving you with gleaming, smear-free windows. To ensure that’s always what we deliver we work to the standards set out by a number of independent accreditation bodies. But the most important standards are those demanded by our customers, and consistently meeting those is the secret behind the company’s longevity. If you would like to discuss a project or find out more about the type of work we do, just call us on 028 7130 8521. Facebook or call him on 028 7130 8521.